Below we’ve shared a bunch of fun things to do on Maui. Soar high above and through the tree line on a safe zipline course. Not only is this one of the more fun and exciting activities to do in Maui, it also is educational. While you take the short hikes from zipline to zipline, you’ll be treated by a well-informed guide with information about the local foliage, animal-life and local culture. Often if there’s swell in the water or the weather isn’t perfect, Molokini will be your best bet at finding clear waters to snorkel. This sunken volcanic atoll is a marine sanctuary, making it ideal for snorkeling and scuba diving. The amount of life on the reefs can be incredible! Pride of Maui offers some of the best rates and best trips. No trip to Maui is complete without at least 1 luau experience. There are around a dozen different luaus available on Maui, many which offer authentic feasts, live music, hula dancing, cultural craft-making displays, historic narration, tropical cocktails, Imu ceremony, and fire knife dancing. Choose the right luau for you and your family, and you’ll be back again next time. Take a scenic tour of pineapple fields and visit a working pineapple operation! You’ll learn about the various cultivation techniques, about the growing cycle, and taste pineapple at each stage. They have lunch options at Hali’imaile General Store and you get a free pineapple with each tour. Nothing captures your trip to Maui better than a professional portrait taken on the beach. Grins 2 Go in west Maui can take these photos at your convenience on a beach near you. Their expert Maui photographers will travel to south Maui, or take photos in Kaanapali (or anywhere else you may care to be.) They’re friendly, talented, and inexpensive. Call them today! Sit back, relax and enjoy panoramic views of Maui’s gorgeous scenery with one of Trilogy’s famous sunset catamaran cruises, like the daily Kaanapali or South Maui sunset sails or weekly Aloha Friday sunset sail! Appetizers, alcoholic beverages, and live music included. Perfect activity for all ages & a great way to see Maui’s beauty from the water! In the winter season, Humpback whales migrate across the globe to Maui waters in order to mate and give birth. At peak season, it’s very difficult to look out at the ocean and not see some kind of surface behavior by these huge mammals. Watching them from a boat breaching nearby, singing their songs below you, and enjoying a good sail while you’re at it is worth the world. While on a kayak, you not only get to enjoy a great sport, but you’re able to go snorkeling, whale and dolphin watching, and see parts of Maui that are rarely seen. Maui Kayak Adventures will take you on any one of a number of great tours near your hotel/resort. Honolua Bay, Turtle Town, the Pali Sea Cliffs, and other great spots off the south and west coast of Maui. Take your snorkeling adventure to the next level with Redline Rafting. Hop aboard the fastest raft on Maui and cruise to the front and back side of Molokini Crater, La Perouse Bay to see the Hawaiian Spinner Dolphins, and snorkel with sea turtles at Turtle Town. Experience the waves and great views of South Maui from the raft, which offers a more adventurous and less crowded way to get out on the water! Enjoy the best in Maui Bottom Fishing aboard Marjorie Ann, the 36′ Chesapeake Bay fishing boat. Small groups ensure personal attention and proper coaching for beginners, and experienced crew will help you catch the best and tastiest fish available! Tours include bait and tackle, and private charters are available for sport fishing, whale watching, sightseeing and sunset cruises. Excellent staff and rates. Explore Maui in an iconic, classic car from Maui Roadsters. These 1957 Porsche 356 Speedster reproductions are fun to drive and offer a unique way of seeing our island. Drive above the clouds at Haleakala, along rugged coastline to Hana, or to your own remote beach. These classic cars are also perfect for weddings, groups and corporate events. We believe there’s no better place to go snorkeling than over the reefs of Maui, Hawaii. Travel to nearby Molokini Crater on Kai Kanani (one of the newest catamarans on Maui.) They enjoy an unshared location in convenient Makena, just outside of the Makena Beach & Golf Resort. At Island Art Party, you’re only a brush stroke away from Picasso. With expert guidance, you’ll transform your white canvas into a masterpiece! No painting experience is needed, and if you need help loosening up, just grab a glass of wine or beer from their bar. While most people bring home seashells, you can bring home a piece of art painted in paradise! The Mill House Restaurant, located conveniently at Maui Tropical Plantation, offers a gorgeous location for the dining at The Mill House Restaurant. They serve lunch and dinner with a menu that changes daily due to access to fresh produce harvested from their organic farms on property each day. Get your heart rate pumping with a one-of-a-kind downhill biking experience along the slopes of Haleakala Volcano. Choose from one of two fully guided tour experiences with Cruiser Phil’s, or set your own pace on a Bike Maui self-guided biking experience. Remember to wear layers, and enjoy a magical day around Maui while taking in otherworldly panoramic views. For an early morning experience unlike any other, a guided tour to the summit of Maui’s Haleakala Volcano – the largest dormant volcano in the world – is an absolute must for travelers of all ages. Tours include transportation to and from your accommodation, expert narration from a local guide, jackets and gloves, and a full breakfast with a view at Kula Lodge. A great budget value for all ages, Malolo tours offer snorkeling excursions to Maui’s most memorable snorkeling locations, including the stunning Molokini Crater and South Maui’s famous Turtle Town, where guests have the opportunity to snorkel with Hawaiian Green Sea Turtles. Enjoy breakfast, lunch, and beverages aboard the 55 foot catamaran. You’ve heard it again and again. “You MUST do the Road to Hana!” Driving to Hana and back is a lot of fun, but not for the weak-stomach. You’ll make many twists and turns while passing numerous waterfalls, beautiful cliffy coastline, and through tropical rainforest. Ride withthe windows down to indulge in the jungle scents. Order the Road to Hana CD for the best experience! Head out for a jungle adventure on this fully inclusive, super safe rappelling tour along the stunning Hana Highway with the pros at Rappel Maui. This thrilling experience of a lifetime begins with a guided drive halfway along the Road to Hana to arrive at a 30 acre botanical garden, where you will rappel down several flowing waterfalls, enjoy a catered lunch, and swim in natural pools, all while enjoying Maui’s most lush landscape. Channel your inner kid at Maui’s newest indoor activity park. With tons of space to spread out and jump alongside new and old friends, kids – as well as adults – are sure to have a memorable time at this family-friendly trampoline park. There is no age or size limit to participate, and their $2 specially-designed socks are required to jump. We know from many experiences how exhausting it is to travel with surfboards and all your bags. The next best thing is to drive to a surf shop and sort through boards for rent. The best way to surf while on vacation here on Maui is to choose your board from Island Surfboard Rentals’ website, and have it delivered directly to your door. They also have beach gear, water cameras, and every board you could imagine. Picture yourself sitting down to a delicious meal at the Mill House with views of the majestic Waikapu Valley where you can actually see the organic farms from which your meal comes from. Then picture yourself walking through vineyards on the slopes of Haleakala with amazing views of both coasts while sipping local wine. Picture yourself then getting a tour through the innovative brewing facility of Maui Brewing Company. Now try and do them all on the same day while driving yourself? Not a great idea or nearly as fun as having a knowledgeable guide driving you and introducing you to the artisans themselves. Partners Visited on Tours: MauiWine, Maui Brewing Co., Hali’imaile Distilling, Hawaii Sea Spirits, The Mill House, Surfing Goat Dairy, Maui Pineapple Tours. Head to historic Wailuku Town to enjoy one of Maui’s newest indoor thrills: Mystery Maui! With two fun, family-friendly and challenging escape room mysteries to choose from, groups of two to six people are invited to participate in their own private game, filled with plenty of intrigue and intense fun to keep the pressure on as you try to escape in less than 60 minutes. 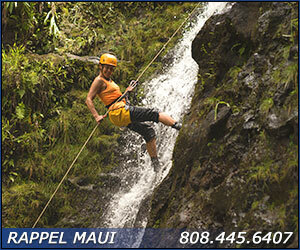 Maui Zipline Company: A Perfect Day with Kids!